Heat milk in saucepan over medium heat until it just begins to bubble. Add Cream of Wheat, butter, 1 tablespoon cocoa and salt. Cook and stir 5 minutes or until mixture thickens. Add 1/4 cup chocolate chips. Cook and stir until chocolate melts. Remove from heat. Stir in marshmallow crème, a little at a time. Serve warm. 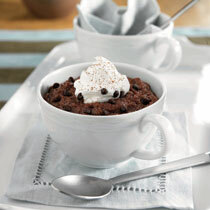 Garnish with whipped cream, cocoa and mini chocolate chips, if desired. Tip: For a delicious taste twist, substitute butterscotch chips or white chocolate chips for the semisweet chocolate chips.